Arriving in Cambridge is a moving moment. Walking along King’s College, the biggest of Cambridge’s 31 colleges, certainly has the wow-factor. Memories of famous movies like “The Theory of Everything“ or impressive persons like Isaac Newton immediately come to mind. I enjoyed a warm welcome on the first morning of my arrival. Students of the University of Cambridge gave us advice and handed over Cambridge Student IDs – an honour to be officially part of the academic life in Cambridge. The topic of our first lecture was leadership. But what is the key to leadership? This question – one of the most moving topics for people who want to create change– was the subject content of our first two lectures at Cambridge Summer Institute. I have leaded my school as head boy, was elected member of the Faculty and Student Council of my University. I lead and changed things without a profound tendency to reflect on my style of leadership. Daniel Forde – as representative of the Cambridge University football team and our lecturer – offered a whole new view on desirable characteristics of a leader. Daniel presented many contra intuitive research results e.g. that extraverted leaders had higher profits when followers were passive and not extraverted or that charismatic leaders could create a change in every group independent from the followers’ attitude. Daniel surely will influence all my future leading positions with his ambition to connect academic research with the “real-world”. I really enjoyed the dynamic of being in a multicultural environment. People came from China, Saudi-Arabia, Denmark, Germany, Singapore, Portugal and Greece. An exciting but also a challenging environment was given. 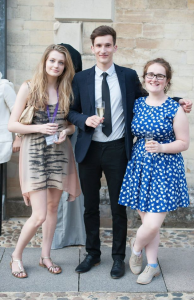 Participants came to Cambridge because of many reasons – some wanted to experience the academic excellence, others were exploring the great teaching for a possible upcoming degree. The variety of fields brought a benefit to the course that was fantastic. Upcoming doctors, lawyers, business graduates, engineers contribute to the summer school. All academic fields were represented. Basically, nothing could stop the success of the academic greatness of the following days.